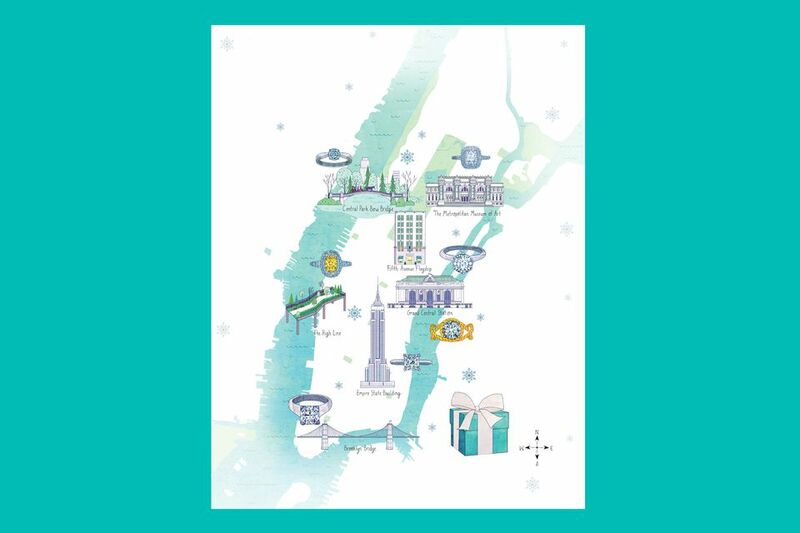 Tiffany & Co.'s brilliant shortlist of perfect proposal spots in New York. Magical window displays. The Christmas tree at Rockefeller Center. Fireside cocktails at fabulous hotels. The glorious lights that transform Fifth Avenue (and Dyker Heights and Carroll Gardens and the West Village…) into an enchanting yuletide fairyland. Yes, New York City is a supremely romantic place to spend the holidays. Especially if someone’s going to pop the question here between now and New Year’s. If this is indeed the plan, there are no shortage of landmarks and cityscapes to steal away to (my personal favorite being at the top of the Granite Staircase in Brooklyn Bridge Park), but for those of you who might need some inspiration, Tiffany & Co. has lots of great ideas to share with you. Parks and museums. Beloved triumphs of architecture. The southeast corner of Fifth Ave. and 57th Street (can you guess where?). And—surprise—they also have some exceptional Tiffany engagement rings in gleaming gold and platinum to make the moment even more spectacular. Princess-cuts, round diamond solitaires, ovals... Give it some thought and then take your pick. Now let’s take a tour! We love how the Tiffany Harmony engagement ring’s tapered platinum band echoes the shape of this charming Central Park landmark. From $1,910. Tiffany Soleste® yellow and white diamond ring in platinum and 18k gold. With a Tiffany Soleste® yellow and white diamond ring in platinum and 18k gold shining perennially from your finger, your spirits will always be uplifted. The High Line overlooks colorful murals and at night, the Hudson River has a velvety, skyline-lit sheen. From $9,700. Tiffany & Co. princess cut diamond engagement ring in platinum. Utterly timeless, with a touch of Hollywood romance: This Tiffany & Co. princess-cut diamond engagement ring in platinum shines brightest when presented at the top of the Empire State Building. Price upon request. Tiffany & Co. Lucida engagement ring with a diamond band in platinum. Named after the brightest star in a constellation, this Tiffany & Co. Lucida® diamond ring in platinum (from $2,000) mirrors the night sky, best visible from the Brooklyn Bridge. Shown with a diamond band in platinum (price upon request for the set). Tiffany Soleste® oval-shaped diamond ring with a diamond border in platinum. Classic elegance: This Tiffany Soleste® oval-shaped diamond ring with a diamond border in platinum elevates the ever-popular halo style to a work of art. From $2,950. The Tiffany Setting engagement ring in platinum. Arranging a rendezvous on the corner of 5th Avenue and 57th Street might blow your cover. But who cares? With The Tiffany Setting engagement ring—a true style icon—in your pocket, you can do no wrong. From $1,780. Jean Schlumberger diamond Rope ring in 18 karat gold and platinum. A design by one of Tiffany’s most legendary designers, this Tiffany & Co. Jean Schlumberger Rope ring in 18k gold and platinum features a round diamond center stone. It’s the perfect way to start your journey together. Price upon request.